Interested in using the same speakers to listen to more than your iTunes collection? Many iPod docks include a standard 3.5mm auxiliary input jack. Some have built-in radios, and some can connect to Bluetooth-enabled devices (including phones and computers). 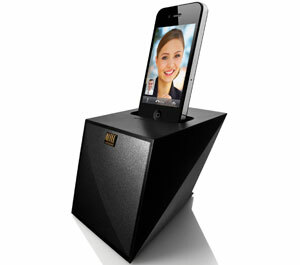 With Bluetooth, you may be able to use the dock as a speakerphone in addition to wirelessly listening to audio from the connected device. Want to take your tunes with you to the backyard or the beach? 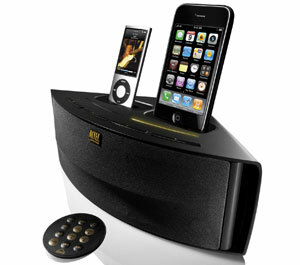 A speaker dock with rechargeable batteries is the perfect solution. If all you need is room-to-room portability, some plug-in docks have built-in handles for carrying. And the smaller the dock, the easier it is to move and find a convenient spot to place it. 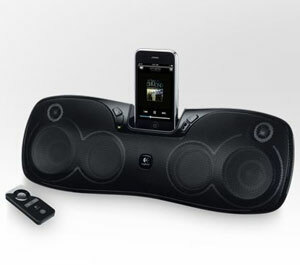 Most (though not all) speaker docks come with wireless remote controls. Some are full-featured affairs, including the option to navigate your iPod menus while docked; others are limited to play/pause, fast forward/reverse and jumping forward or back by a track. Some docks will work with alarm clock apps, from the manufacturer or other sources, to create a highly customized morning nudge. However, if the iPod/iPhone owner takes the device on the road, there goes your alarm clock. Other docks have traditional built-in alarm capability in addition to the app-based kind. Here are five docks that passed our hands-on testing with flying colors. 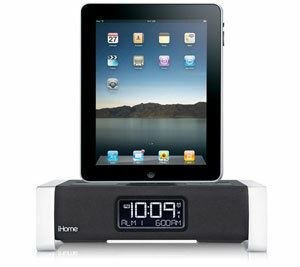 iHome makes an extraordinary range of iPod docks in all shapes and sizes, but this one is our all-around favorite for its exceptional combination of sound quality, compatibility and feature set. The iA100 works with iPods, iPhones and iPads thanks to a cleverly designed top dock connection. It also has Bluetooth compatibility for wirelessly connecting your suitably equipped Apple or non-Apple device, plus an auxiliary input jack. There's a built-in alarm that can be controlled from the dock or via a free app on your docked device, with exceptional control flexibility (two separate alarms, which can be specified for weekdays or weekends, with gradually rising volume, etc.). 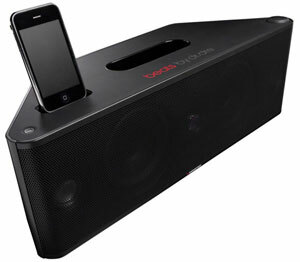 We also like the optional $2 iHome+Radio app, that puts 30,000 worldwide radio stations at your disposal. The perfect solution for the two-iPod/iPhone home, the Octiv Duo will dock and charge two devices at once. There's even a free downloadable app that will mix the playlists from the two to maintain domestic tranquility, along with an alarm clock app. Even with room for two, the triangular dock is fairly compact, at about 10 inches across and 6 inches deep, so it should fit easily on a nightstand or any tabletop. Sound quality is pleasingly clean and clear, as long as you don't crank the volume all the way up. And the circular remote is nicely designed, with full menu control and clearly labeled clicky buttons. When you want to carry big sound around, the Logitech S715i is an excellent choice. The dock itself is protected from the elements while traveling with a hinged cover that doubles as a rear leg when opened, a welcome touch. You won't find fancy features here, just powered speakers with a basic remote control and an auxiliary input jack. You will find compelling audio, though, with a nice bass boom and volume levels that effectively fill substantial outdoor spaces. The S715i measures 18.8 x 5.5 x 3.7 inches and weighs 3.5 pounds, making it easy to tuck under your arm and carry along (a soft travel case is included), and the eight-hour battery life is impressive. This is the perfect solution for your office cubicle, or anywhere you want a simple, sweet-sounding speaker at a reasonable price. The Octiv Mini lives up to its name, measuring a petite 5.3 x 3.9 x 3.8 inches. There are no controls at all – the speaker turns on when you dock your device, and you drive using the player screen. What's important here is solid audio quality from an inexpensive device; vocals sound great, and while you certainly won't get soul-shaking bass, the sound is nicely balanced overall. And as a bonus, the dock design has an attractive design, with beveled edges and sleek sloped sides. 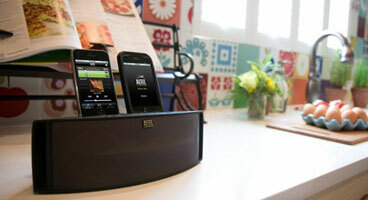 If the high price for Monster Beats iPod/iPhone dock surprises you, so will the extraordinary audio quality. It's essentially distortion-free even at the room-filling top volume, with powerful bass reproduction that's sweetly musical rather than merely boomy bluster. Ordinarily MP3s can sound a bit undernourished, but through the Beatbox dock we found the sound full and rich, from finger-picking singer-songwriters to stadium rock anthems and even classical orchestral performances. There are no bells and whistles to play with, just a dock and an auxiliary input for non-Apple sources. You will need to clear some space for this large piece of gear, measuring 20 inches across and 6.5 inches deep. If you're eager to squeeze serious sound from your portable player, it's worth the effort. This is just the kind of review I have been hoping to find. Thank you!